“All Lan Na wats are beautiful.” I agreed with the gentleman in Nan who told me this (Nan is a historic city that thrived within the northern Thai kingdom of Lan Na in the 15th and early 16th century). And every wat is different. But northern Thai wats have common features that make them many people’s favorites. I met several locals who prefer northern Thailand to the south, and I encountered many Westerners who decided to move there. Come and explore some of northern Thailand’s magic. Northern Thai wats are known for their human scales–no Angkor Wat behemoths here. 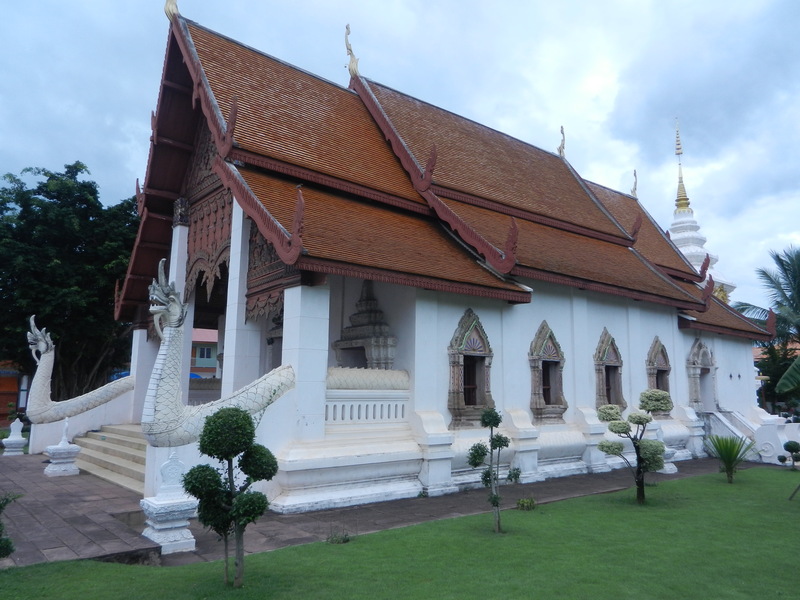 The vihara (public assembly hall) of Wat Hua Khuang has the sinuous forms that you’d expect in Thai art, but it’s small and cozy. Yeah, two serpents guard the stairway in front. But ignore them, and the viharn is as inviting as a gingerbread house. 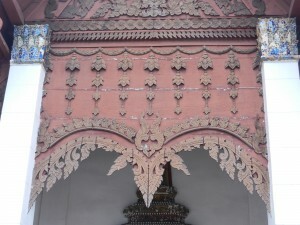 Above, you can see a detail of the board over the entrance. 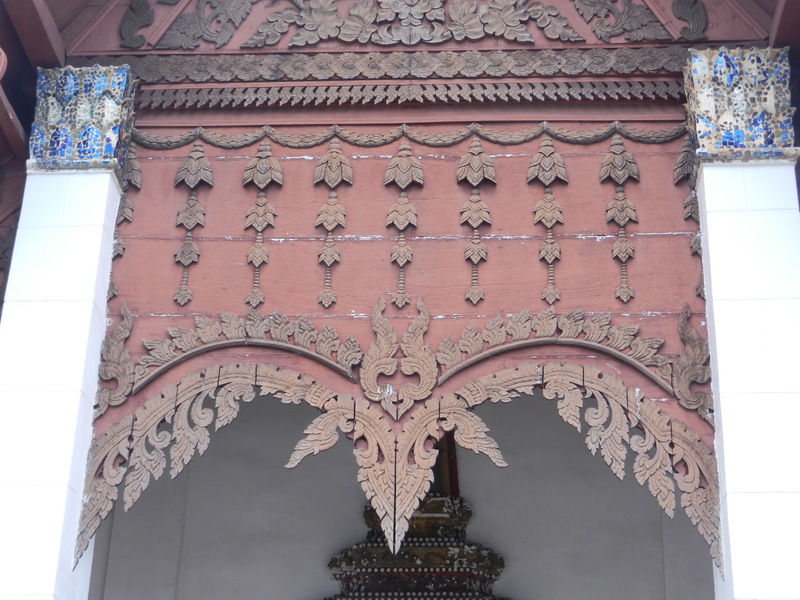 The wing shape’s common in northern Thai wats–it represents the Buddha’s eyebrows. The carved bunches of flowers hanging straight down add an extra gentle and elegant touch to this humanized form to invite people to come inside. 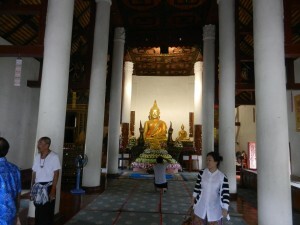 I always enjoyed sitting in viharas in Thailand. The people’s gentleness and cheer mixed with the beautiful art forms. 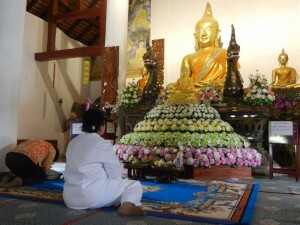 But since Wat Hua Khuang’s vihara isn’t much bigger than a living room, it felt even more homey. Locals seemed to find the wat a pleasant place to visit to pray or just feel connected with the universe. Thais are more comfortable with a universe that’s on a human scale than the vast cosmos from Indian traditions. And they’re more at home with a multitude of shapes that bend and colors that flicker than the rationalized classical proportions in the West. Wat Hua Khuang perfectly blends both–the universe full of abundant energies is brought down to our size so the community can happily live in it. And this dude from outside the community was happy to hang around for a while. 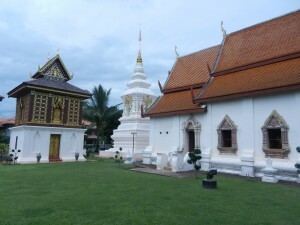 Abundant energies in nature and the cozy community–these seem like contrary ideas, but they have shaped thought in Thai and most other Southeast Asian societies since they formed communities along rivers thousands of years ago. So Thais became experts at integrating both senses of the world in their art. They can mesh in infinite ways, so Thai art has limitless variety, and there’s no end to the perspectives you can have of a great work. The more you explore it, the more magical it becomes. So we’ll hang around Wat Hua Khuang a bit more in the next post.